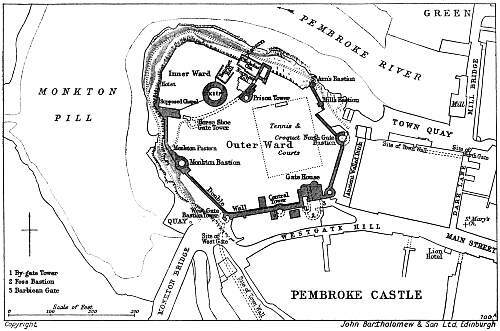 The castle was probably started by Arnulf of Montgomery, who arrived at Milford haven in 1090. 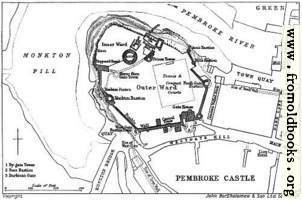 The map or plan of the castle shows the Pembroke River flowing towards the West, Monkton Pill (presumably a sort of pond), the Inner Ward with the Hoist, Supposed Chapel, Banquet Hall, St. Nicholas Chapel near the Wogan Cavern, the Norman Hall and the circular Keep, the Outer Ward with the Prison Tower, the Horse Shoe Gate Tower, the Monkton Postern leading to the Quay, the Monkton Bastion and, following the Double Wall round, the Central Tower, Gate House, North Gate Bastion, Mills Bastion, and St. Anne’s Bastion. The numbered items by the Gate House are By-gate Tower, Foss Bastion and Barbican Gate.